Perfect, and so very convenient for all my medications. I use this for my medication. I used to keep all my pill bottles in a drawer..they would roll around, be hard to find the right bottle. Drove me crazy. But now my pills are altogether in one great bottle. If you take a lot or even a few meds then this is for you. Excellent product. Will buy some other as gifts. I thought I could use it for vacations but it's too big but it's hard for me to open bottles so now I put all my medicine in there and use it everyday it's a blessing not having to open bottles!! I LOVE IT!! Efficiently organizes and dispenses even largest pills/capsules. Easy to use and refill. Will order several more for storage of small screws, nuts, etc. Wife wants one for storing cake decorations. I use this to store my medication, it's so very convient to use. There is nothing negative i can say about it..It's great. Bought as a replacement for various pill bottles in my cupboard. It saves a huge amount of space. I ordered a second one and 2 more for a relative! This product has been a time and space saver for me. No more dozens of bottles sitting on the counter and I only need to refill this one time a week. Purchased 2. The "flap" is large enough for the container to store/dispense large oblong vitamin pills. Might be too heavy for travel, but between the 2 - all of my daily pills are convenient. No longer have to fuss with individual pill bottles, just open flap & dispense pills from each section - then close. Thus far appears sturdy. I bought this for my father so he had all his medicines in one place. This is a wonderful way to keep track of this!!! A very good product. I recommend it. Keeps from fumbling around for your pills!! I never keep my meds in the bathroom. I got this to take on a trip and it worked well. Very easy to use. It is sturdy and I don't find any downfall. I take multiple meds and this container allows me to have them all in one space. I do have a small container that I have in my purse. But for overall storage, this beats having multiple bottles everywhere. This was really great, I had six different medications on my night stand. Alot of clutter. Now everything in one bottle and with labels on it. Works fine for me. My Mom loves the two I got her to keep her vitamin pills in. Means she doesn't have to open and close all the individual vitamin bottles every day, just choose the section with the vitamin she wants and slide the top to it and shake one out. Very easy to use. We use for our daily vitamins so we don't need to keep a lot of bottles on the table. We're able to minimize other # of vitamin/supplement bottles on the table. It reminds us to take or vitamins! I use this to keep my teens pills in and teach him how to learn sorting his pills in the weekly pill box by having them all in one container. If he runs out in the weekly box he is still able to take out of the pill storage one at a time quicker than opening up 8 pill bottle in makes it quicker having 6 in one and only having to open 2. Its great to travel with also than taking all pill bottles. Been looking for this type of pillbox for a long time. Keep vitamins in one & my husband keeps his medications in other one. We had one similar to this that we were trying to replace for a long time. The price is right, too. I kept one of these for years. I used it for all my prescription medicines. It doesn't hold but one bottle of medicine, maybe two if the pills are small, like baby aspirins. I found two major concerns: 1.) If I LEFT THE MEDICINE IN EACH CONTAINER FOR MORE THAN TWO WEEKS (even leaving it in the kitchen), I was afraid that the pills would get humidity on them, or go stale, or loose potency. 2.) If I put two months supply in one container, it was too difficult to remember to call in for refills. I had to write the numbers down or keep the empty bottles anyway. So, I stopped using it. Recycled the bottle. It would be a good container for most herbs. This is all fine and good but didn't come with labels. Now I have to go find them somewhere. The picture would give you the impression of something much smaller. This is not a pill bottle you could just put in your purse and go, it is much too big. But for sitting on the counter, it keeps six different meds in one place. The top is very hard to open, and the little flip top is also had to open. Nice design but... I have an arthritic wrist, and this product is not easy to use. I would not risk storing valuable prescriptions because the lid is difficult to pop off and when you push down to close it doesn't rotate unless you have top kept loose. Dispenser is difficult to snap down. These are major flaws requiring and new cap design. have purchased these B4 from other companies; never had problems. This time out of the 3 I bought from easy comforts, 1 had a slight crack; the opening on the other 2 wouldn't wouldn't work properly, they broke. It was 2 expensive 2 return so I had 2 dispose of them. I thought this was the size of a pill bottle BUT it is huge and WAY TOO BIG to carry around. You need a large purse to carry it with you or your bag will look too bulky. I would not recommend buying this if you are looking for a compact pill organizer that fits all i no ne. I bought two of these. I do not have arthritis, yet I find the top hard to turn and the bottle exasperating to fill, as I have not yet been able to remove the top from either bottle. I returned the product. I don't like to do battle with lids! This is a convenient way to have pills all in one place. Unfortunately it is very difficult to use as it is hard to twist around for each compartment. I am hoping it will get easier with continual use. I have had something like this before and like the convenience and space-saving elements. I have quite a few vitamins that I take daily. This will keep them orderly for me. I already purchased this item and now I need 2 more. To free up space in the cabinet. Have 2 already, love them! Have one and like it. Buying now for someone else. We have several of these. They make life easier. I think this will make things a little easier than having to open up several bottles every morning. I will be removing the cover and using as a pen and pencil holder on my desk. The six sections keep the writing implements standing up straight and easy to select. It will save me a lot of space. Have already purchased 4 of these for myself and family--it's so useful! I get confused with so many medicines to take. This way, they are all in ONE bottle instead of several. Replace the one I have had for over ten years. It is very helpful for me when I am traveling., and at home. These items make easier some or My daily routines. Does the top come off for loading in the pills? I have just received mine and can't see how to take the top off. BEST ANSWER: Thank you for your question. The 6-Section Pill Organizer is BPA free. We hope this information will be of help to you. If you completely close the lid, very hard to open. You have to put your finger into the opening where the pills come out of and try to manuver the top. If you close the top loosely, you can open the top. However, if you are taking a trip, you have to keep it upright. Why is the lid so hard? BEST ANSWER: I have 3 of these dispensers, and I only have one that is similar to yours. It must just be the way it was made. I've found that if I constantly fiddled with it enough, it became a little looser. I do really like these, as you say for trips you need it securely on. I've never had any issue with this item. I like the fact that it is tight when closed. I like the security of the pills not being able to fall out. I use this container every day. I find the lid hard to open convenient. I put the pills in through the pill small opening with a Kleenex and put the container in a ziplock bag when I travel. How many pills can you get into each divided section? 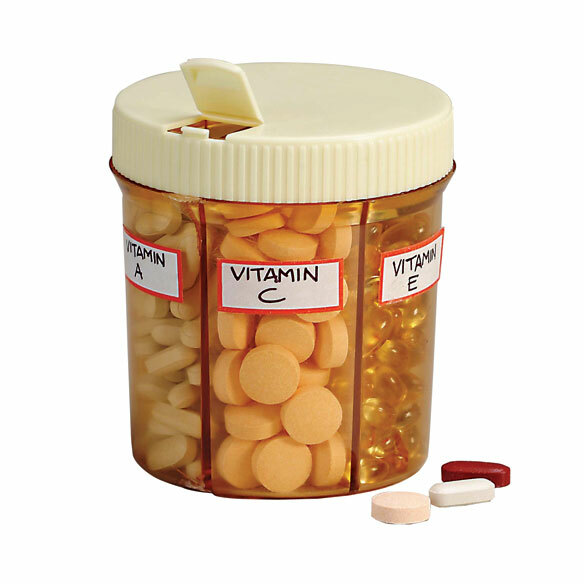 BEST ANSWER: I can fit about 40 Vitamin C pills, 1000 mg, in one section of the pill container. Most pills are smaller than that, and I have no trouble fitting a bottle full of my scrips in one section of the pill container. I use my 6-section pill container daily, and highly recommend it to anyone who takes multiple kinds of pills daily. It depends on the size of the medication. For horse size probiotics maybe 15-20. For normal size tablets and capsules you can put in at least a month's supply. Depends entirely on the size of the pill. The number varies from thirty to forty or from twelve to fifteen in the pills that I use now. What is the WIDTH of this container? Is it food grade plastic and BPA-free? BEST ANSWER: Thank you for your question. This item is 3 ¼” wide at the bottom, 3 ½” wide at the top, it Includes 7 blank labels and is dishwasher Safe and BPA Free. We hope this information will be of help to you. What is the width of this container? Is the plastic food-safe and BPA-free?